← Lesson 3 – Lock That Rock! As taught, this bracelet cuff is lovely as a feminine bracelet – but once you’ve mastered this technique, you can create a myriad of variations and use the principles to create beautiful, versatile wire jewelry pieces for a wide range of uses! This graceful cuff bracelet teaches you how to straighten, bundle, and wrap a stunning cuff that you can wear right away! Since when has a technique class been this fun and rewarding? 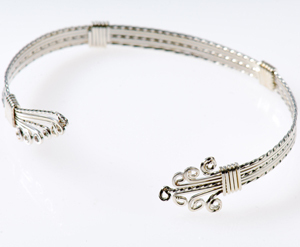 Learn the fundamentals of wire jewelry crafting and design from a simple bracelet. And don’t worry if it doesn’t turn out the first time. This is a project you can make over and over again in copper square wire before you make it in the Argentium or Gold Filled wire of your choice. Plus, you’ll get the option to finish the cuff in the design of your choice, reminiscent of flowers, arrowheads, ocean waves, angel wings… you get the idea – now start in on this bracelet! This bracelet is all about square wire. Why square wire? Well, nothing else twists and wraps just like square wire! 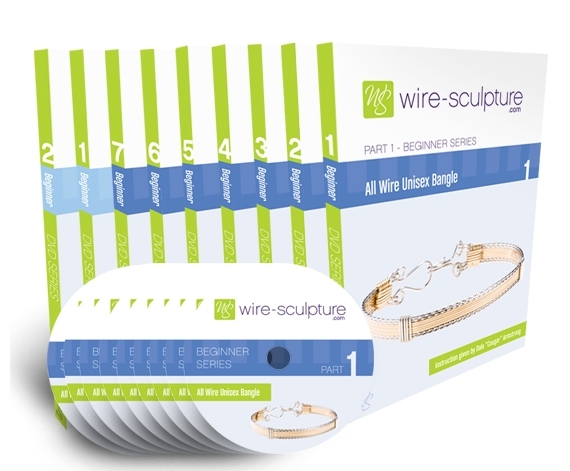 When you’re making a quality piece of wire jewelry in a high traffic area, like the wrist, you want a reliable shape that will hold through thick and thin – square wire will do that for you! Stunning for children through adults, this cuff will teach you all the basics and let the designer inside you take flight. to install it in under a minute for FREE! I had already made one of the bracelets from the beginner series, but this seemed much easier to follow. I choose to do the angel wing on both ends and love it, as I am an angel jewelry designer with metal components. I could easily see taking just about another 1″ of wire and this way you could overlap the wings at the bundles and it gives it a nice flair. Very sweet. OHHH i am having SUCH a hard time finding a wire jig that i can turn and now the one you guys sell is not available i have looked and looked for the one on the other videos “the thumb operated one” NO WHERE to BE FOUND. now i am going to home depot and crossing my fingers.. I can’t turn the regular jigs it is just tooo hard for my hands.. and i am sooo anxious to get a bracelet made!!! Hi Evelyn, I am so pleased that you can now ‘wrap’ : ) If you follow the same procedure when you use anything from square or half-round, you will never again have that challenge. No problem Evelyn – personally I wish we would go metric as it would make the world more consistent. Having lived overseas for a number of years, I find the metric system to be a consistent system based on 10s. Not only that, it is easier to measure in small increments. I appreciate it, Dale, that you take the time to give us both measurements when you have the time (I simply flip my ruler around and use metric anyway). I also understand the difficulties some people have in understanding the need for the metric system. I would like to note that I’m an educator (university) and I really like your teaching style. Thank you–your classes are enjoyable. You have “measurably” improved my technique! Thanks again Patricia – I really appreciate your comments about my style of instruction. I am also glad to hear that they work so well for you, a fellow educator. I really enjoyed working along with your video. I had problems making my wraps neat and flat but your technique really helped. No more twisted or overlapping wraps, or bunched wire and I have a beautiful bracelet to show off. Thanks for a great lesson! Yeah Mary Ann! So glad I could help you with the main construction in traditional wire jewelry creation!! I belong to the Golden Spread Gem and Mineral Club and We just had a show Nov. 6 and 7. I made this bracelet in copper as a door prize. and several of the members like it I am hoping to make several to sell next year. Thank you. Far out Marilyn! Keep on wrapping! This was a really fun piece to make, and I appreciate the diagram that you incorporated into the lesson! In this lesson as well as the previous lesson, you refer to written instructions that accompany these projects. Are these available for the on line classes? I too am wondering about the written instructions with these on line class videos. I hope they are available as my memory sometimes plays tricks on me. Yes, I’m a senior citizens with “senion moments”. Advice from a teacher to Chris and others: Watch the video several times and TAKE COPIOUS NOTES! Don’t just depend on the PDFs to jog your memory. The information you are gettting is priceless. If you can, the magic number to watch (or listen to) something is seven. This is a psychological truth. Instead of worrying about trying to get all the information while you have the video available, relax, watch it, then watch it again and make the item. Stop and start and take notes where you have problems or where the technique gives you fits. You have it for a month or three months. It’s typical to “freak out” and try to remember everything–then forget. Relax, take notes, and you’ll remember. I’ve purchased some DVDs (at first I swore I wouldn’t because of the cost) but they are WELL WORTH IT. You learn to make a piece or two, but the techniques learned are priceless. I’m not a know it all by any stretch–I’m passing along what has worked for me–and what I would advise my students as an educator myself. These are great videos! Hi Patricia, thank you so much for your affirmation of my teaching style. I totally agree with you when it comes to learning – watch first to get the idea, a second time to take notes and a third time to check yourself – then play! I just finished my first cuff and proudly wore it to the post office when I went to pick up my mail. (My husband and I live way out on the mesa in NM and don’t get mail delivery at the house.) The postmaster that complimented me on it did not notice that the measurement on the bindings was off by a half of an inch for some reason! Indeed, mine is wanky too. After looking at the diagram over and over, trying to figure out where things went wrong, I realized that it had to be a very basic measurement…like maybe the center point. I went back to the video and watched as we marked the center of a 7 1/2″ bundle at the 3 1/4″ point. I think that is it. I followed right along and did the same exact thing. I think that the center should be at the 3 3/4″ mark, yes? That would explain why one of the ends of my bracelet measures 1/2″ longer after the mid binding than the other. It is still beautiful, and now I will never forget that measurement! Maybe wire-sculpture can just put a note somewhere in the intro to the video. Please forgive me for being cocky if that is not the reason for the discrepancy, but it figures out to be about right to me. I do have a question. The ends of the binding wire inside of the bracelet are pretty sharp. I filed them down with a diamond file, but I am wondering if I could have cut or tucked them differently to avoid this. What do you suggest? Thanks, as always, for the inspiration. This type of piece is perfect for the upcoming gift-giving season, and I am already thinking about personalizing the design with different metal and twist combinations. You rock! PJ – for the sharp ends on your binding wires, try using a pair of chain-nose pliers to grasp and pull the very end of the wire, while giving it a slight curve toward the back of the bundle. By holding and pulling, the wire’s end will be forced into a graduated slope, heading toward the bundle so it can just be pushed into position.